Best Buy for electronics, computers, appliances, cell phones, video games & more new tech. Buy a discounted gift card to save on top of their sales and promotions. This works like cash so it can be used to get a discount on Samsung TVs, iPhones, Blu-ray movies, Samsung S6. 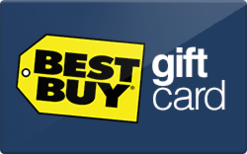 BestBuy giftcards can be used online on BestBuy.com or in-stores.